With the upsurge of the healthcare technological revolution, the ways in which drugs and medications are prescribed, distributed, and handled are rapidly changing. For instance, technologies like computer-based labeling and stock management, and automated patient pack and unit dose dispensing systems are helping pharmacies significantly reduce working hours assigned to choosing and stocking medicines. Furthermore, the growing prevalence of wearable devices and health trackers is enabling pharmaceutical companies to aid patients in decoding the information from their wearable and suggesting necessary medications based on the input, rather than being confined only to medicine dispensing. To put it succinctly, modern pharmacies are no longer mere drug distributing institutions but have evolved into health management centers. By gaining access to cloud-based processes and digital health solutions, pharmacies now have the capability to acquire the same amount and quality of medical data that clinicians acquire, while being able to print out drugs as and when required. This is where 3D printing of drugs comes into the scene. The technology is already shaping up as a viable technique of drug creation, thus boosting the distribution of medicines to patients. Through espousing such disruptions and bringing new-fangled technologies into practice, pharmacies can seamlessly upgrade the quality and range of the services they deliver, while keeping the costs low. The market today abounds in a bevy of pharmacy management solution companies equipped with state-of-the-art technologies that can help companies gain proactive ideas to tackle looming challenges. To help CIOs navigate this flourishing landscape, a distinguished panel of selectors, consisting of CEOs, CIOs, VCs, industry analysts, and Healthcare Tech Outlook’s editorial board has shortlisted the pharmacy management solution providers that are at the forefront meeting the urgent needs of the industry. The listing offers an insight into how these solutions are put to use, thereby enabling you to gain an in-depth insight as to how they will optimize businesses. We present to you Healthcare Tech Outlook’s Top 10 Pharmacy Management Solution Providers - 2018. AscellaHealth provides customized and full-service pharmacy benefit management solutions and robust clinical programs. The company constructs innovative solutions to meet the unique requirements and financial goals of their clients by allowing them to offer the prescription drug that benefits their employees want. AscellaHealth is world’s leading pharmacy management solution provider which is specialized in creating customized designs that fit the unique requirements of its clients allowing them to choose from stand-alone options or utilize full service as per their necessities. The services are combined with state-of-the-art reporting and analytics that helps clients to focus on important matters and control the member outcomes. AscellaHealth collaborates with healthcare professionals with a common goal of delivering the best possible clinical outcomes for their members. The prescription drug therapies are a crucial part of overall health and wellness and the free tools and resources of AscellaHealth can help people to manage their health with ease and convenience. 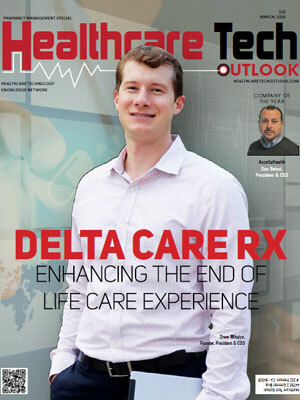 Delta Care Rx provides pharmacy benefit management, on-demand pharmacist services, electronic prescribing, and other software as a service specifically tailored for the hospice industry. The leading pharmacy management solution provider, Delta Care is enhancing the hospice pharmacy industry through innovation, business transparency, extreme customer service, and maintaining a vital community-pharmacy relationship. The company also offers tools and technologies including telemedicine to simplify necessary workflow and ordering processes within hospice settings. The Delta Care Rx model delivers transparency for all stakeholders, as well as an economic, fair community pharmacy medication distribution model that large hospice PBM’s are unwilling to embrace or unable to deliver. Micro Merchant Systems offers an innovative range of products to help independent pharmacies, hospitals, and institutions. It is a leading pharmacy management solution provider which develops pharmacy software solutions to meet the challenges of today’s pharmacy market by helping healthcare institutions to fill prescriptions swiftly, securely and profitably. The pharmacy software PrimeRx is easy to use and has become an integral tool for the staff’s prescription workflow and is enhancing the overall productivity of the pharmacies. PrimeRx is a pharmacy dispensing solution that provides tools to simplify workflow, process claims, patient and provider intake, managing inventory, and label and dispensing. The benefits of PrimeRx are integrated patient management to assist identifying medication synchronization candidates, insurance management to raise revenue and profitability, prescription efficiency with lowering dispensing errors, and patient medication adherence reports to enhance CMS Five Star ratings. Allscripts enables healthcare providers to provide efficient care delivery, workflows, and patient behavior using EHR, financial management, population health management, and precision medicine workflows. It is a leader in pharmacy management solution moving forward clinical, operational, and financial results. The innovative solutions of Allscripts connect people, places, and data over an open and connected community of health. The caregiver can take better decisions and offer superior care for a healthier population with connectivity. Allscripts introduced the concept of open, connected health platform to enhance the communication process by directly engaging with patients and improving the operational performance and patient outcome. Allscripts solutions facilitate real-time analysis that enables healthcare companies to analyze and act right at the need of an hour reducing costs and improving health. BestRx delivers easy-to-use software solutions catering to the needs of independent, community pharmacies to enhance their efficiency, profitability, and patient care. The leading pharmacy management solution provider provides software that delivers complete pharmacy solutions to independent or retail pharmacy. The BestRx system is designed in a user-friendly way and does not require any training in utilizing the system. It offers a powerful and feature-rich system at reasonable costs and provides the best solutions to help organizations to expand their business. The software has a dynamic reporting feature that enables the pharmacy to function with ease and gives the ability to manage the patient profiles, workflow, processing and billing, accounts receivables, and inventory effectively. Cerner provides pharmacy solutions designed to capitalize on pharmacists’ clinical capabilities within both the medication process and patient care continuum. It is the leading supplier of pharmacy management solutions and healthcare information technology solutions that make the best use of clinical and financial outcomes. The healthcare organizations vary from single-doctor practices to big hospitals has been utilizing the instinctive solutions provided by Cerner across the globe. The company supports its clients by surfacing data which allows them to supply their clinicians with the information they required to deliver smarter care and make informed decisions for better management of operations. Cerner provides its clients with a dedicated focus on proven market leadership through its end-to-end solution and service portfolio. Liberty Software provides pharmacy management (RXQ), multi-store management, and pharmacy point of sale (PoS) services to enable community pharmacies to serve patients better. Liberty’s pharmacy software gives the opportunity to organizations to design their own as per their needs as the workflow includes RPh Check, Final Product Check, Count Que, and customizable stages. It automatically emails and text the patients refill reminders, prescription waiting messages, and prescription ready alerts, hence improves the pharmacy’s customer service automatically. Liberty helps a company to identify problems of the patients proactively. During the pharmacist verification workflow steps and filling prescriptions, it saves time by viewing integrated drug facts and comparisons. Prescriptions can be filled faster and correctly at the same time protecting the safety of the patient. McKesson Corporation provides collective distribution and technology solutions to healthcare providers for effective operation, cost reduction, new standards, and patient health improvement. The company delivers medical supplies, pharmaceutical products, and business services to an entire health system that includes biotech and life sciences companies, biotech and life sciences companies, and surgery centers to create a world of better health. The company helps all types of organizations to control the costs, improve quality, and develop efficiency. It brings people and information closer by creating intelligent networks and building necessary connections which enlarge access, reduces waste, and make healthcare smarter. ScriptPro provides robotics-enabled systems to optimize retail and ambulatory pharmacy operations, promoting safe medication use and adherence, 340B dispensing and third-party financial management. The pharmacy management solution company delivers a comprehensive line of over 200 pharmacy automation and management system products that operate in thousands of independent, chain, supermarket, hospital, and government pharmacies. ScriptPro implements a complete ambulatory pharmacy system which is combined with the EHR in just four steps. ScriptPro's unified workflow systems integrate processes required for specialty pharmacy services, 340B programs, high-risk or high-cost medications, and home-based patient medication adherence and enables efficient and timely management of pharmacy dispensing functions. The solutions of ScriptPro include financial management services and strategic planning to help health systems succeed in a dynamic and financially challenging environment. SuiteRx provides integrated and intelligent pharmacy business software, comprising an IPS program to increase the speed and accuracy of pharmacies. The pharmacy management solution provider offers a software which was developed by pharmacists for pharmacists to face the challenges and needs presented in the independent pharmacy market. The aim of SuiteRx is to provide the integrated, complete, intuitive, and intelligent pharmacy software (IPS) which allows small chain and independent pharmacies to use state of the art technology to meet the requirements of the customers efficiently and increase pace and accuracy in the pharmacy. IPS is a comprehensive solution with retail, LTC and combo versions of the software which integrates document management, inventory management, delivery, web portal capabilities, POS, and compounds into one seamless application. It is an all-in-one platform solution from real-time delivery to document management with customized features and workflow.